Note: If your unit doesn't have a folder in the Content Library, submit a ticket to the Service Center. Right-click on the applicable content folder in the Content Library. Select New Content in this Category '...'. Note: If you receive an error message stating "You don't have sufficient permissions...," verify that you are attempting to add content to the correct folder. To request access to a content folder, submit a ticket to the Service Center. Select the applicable content type to add. The properties menu will vary based on the type of content being added. Refer to Four Winds Interactive's training videos for more information on adding specific content types. The Duration field defaults to 30 seconds. 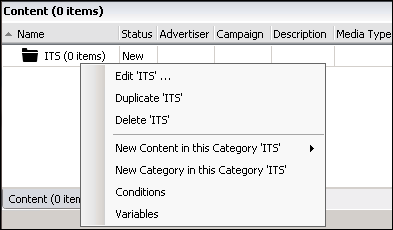 Content items display for the specified Duration in the order they are listed in the Network Overview. Note: The OK button on the content properties window is disabled until all required fields are entered. Drag and drop the new content item from the Content Library to the applicable region of your sign. Note: The content item can be edited at any time by right-clicking it and selecting Edit Source Content. However, it is recommended to add the content item to the sign first and edit it from the Network Overview tree.